I often wonder why people don’t plant vegetables when given the opportunity. For me, one of life’s greatest pleasures is to cultivate a garden. Growing food is seriously the coolest thing! I know that this is currently in vogue - blah local, blah organic, blah - reasons both important and correct, true; but being a stubborn pessimist concerning contemporary ‘trends’, I barely pay attention to these. Growing some of my own food connects me to my roots (no pun intended). Some of my favorite memories include our garden on Nancy Street in Lansing, Michigan. Our family had this huge (by today’s household standards) vegetable garden where our property met the overgrown and uninhabited fields (another source of great entertainment). 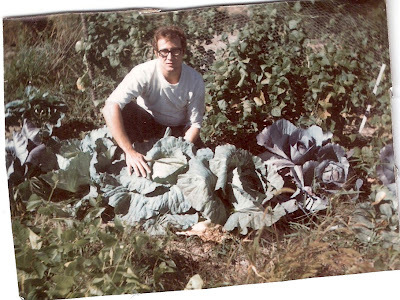 My mom and dad grew everything: corn, tomatoes, broccoli, beans, squash, cabbage, cauliflower, melons, and more. They involved my sister, brother, and I in growing, picking, and preparing our home-grown vegetables when we were little. We took our garden very seriously. As you can see, we have many family pictures of us posing proudly with the bounty. My mom would can tomatoes, and make pickles from the cucumbers and dill. My dad would show us kids how to detect ripeness, and let us help harvest. 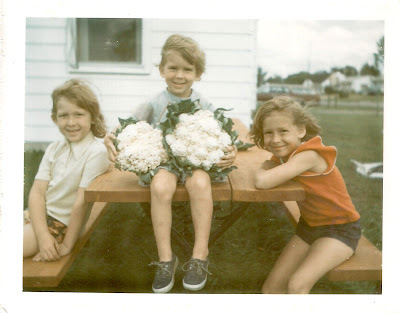 We used to eat all-vegetable dinners in the summer, consisting of sweet corn with butter and salt, tomatoes, and cucumbers - all picked fresh from our garden. Our family would eat outside on the picnic table on hot summer nights, the whole family together. Now that is farm-to-table dining! Those are some of my most memorable meals. Our Nancy Street garden nourished me in many ways. David and I have been growing fruits and vegetables since we bought our house thirteen years ago. We’ve had some excellent successes (the buttercup squash I planted two summers ago was outstanding) and some not-so-hot moments (the year we were overzealous and planted sixteen different tomato plants come to mind). This year, we have three varieties of tomatoes, zucchini, two types of cucumbers, beets, kohlrabi, lettuce, cilantro, dill, thyme, basil, chives, hyssop, and mint. We also have raspberries and blackberries galore! Each summer, I swear that I will make some jam, but I can’t stop myself from eating those plump, juicy berries when I walk past. The temptation is undeniable, and I never have enough left to make jam. Worse, I spend the summer months picking tiny, annoying seeds from my teeth while sporting a guilty look. Still, on certain hot nights, I do love to make an all-vegetable dinner for David and me, just like my family had growing up. Like when I was little, my Oak Park garden nourishes me, too. P.S. When I was in 3rd grade (1976), I buried a time capsule in the rear of our garden, next to the field. Although I don’t remember everything that was in the time capsule, I distinctly remember the excitement of burying it in such a special spot. At the time, I thought it was so well-hidden that it could not possibly be found for many, many years. I imagined someone stumbling upon my time capsule and thinking that the originator must have had such an exciting life! I often wonder about the lucky son-of-a-goose that found it. Also, I would like my ‘Teen Beat’ Shaun Cassidy poster back.